As a prankster from way back, April 1st is a favorite day of the year. I can smell a prank from two miles away – but have to admit, I’ve also been tricked before. Today, it’s easy to get distracted by word-of-mouth rumors, myths and misdirection in the marketing world. With that in mind, don’t be fooled by some common direct mail misconceptions this April 1st. Misconception #1: Most people don’t like to receive direct mail. This couldn’t be further from the truth. In fact, according to the Direct Marketing Association, 62% of Americans enjoy checking their mailbox and 56% say receiving mail is a real pleasure. In addition, as mailers have become more sophisticated in reaching potential customers through better use of data, recipients have increased their interest in receiving it. It only makes sense that if a mailer sends me something that I’m actually interested in, I am more apt to open it and respond. Personalization and one-to-one marketing advancements have only increased this phenomenon. A recent study done by InfoTrends found that the key reason for opening direct mail was because it touches on the needs and interests of recipients. Consumers notice a diverse range of customization/personalization and appreciate the tactile experience of high-quality print and paper. Even millennials who have grown up in the electronic age, respond to and yearn for physical mail almost more than any other group. It is unique to them from an experiential point of view, and as a result, print communication is a highly effective channel. Misconception #2: Direct mail is too expensive. My mother was very wise and used to tell me that you get what you pay for. I’ve deciphered this many times in my life in many different situations. In short, it’s not always how much you pay, but what kind of results you get. In marketing jargon, this is referred to as ROMI (Return On Marketing Investment). Direct mail has been and continues to be the granddaddy of ROMI. It’s quantifiable, and its performance is easily tracked. As such, it has a built-in ability for continuous improvement. By constantly testing new variables and finding new ways to tweak and improve your data, message, creative and more, you are also improving your ability to provide better ROMI for your company. Misconception #3: Direct mail isn’t an environmentally responsible way to market. This is one of the greatest misnomers in the marketing business. In fact, many have argued that direct mail is the most environmentally responsible channel. The reason this is true has to do with the paper industry. The paper industry – the backbone of the direct mail business – is heavily involved in reforestation (i.e., the planting of new trees to replace ones used for paper). In fact, reforestation efforts are usually at a ratio of 2-to-1 or greater. IWCO Direct is Forest Stewardship Council® (FSC®) Chain-of-Custody certified by Rainforest Alliance. This chain of custody certification applies to manufacturers, processors and traders of FSC-certified forest products. It verifies FSC-certified forest products along the production chain and at each stage in processing and transformation. Chain-of-Custody certification is needed to confirm that FSC-certified wood products are kept separate from uncertified products. Certification ensures that products come from well-managed forests that provide environmental, social and economic benefits and that forest owners and managers demonstrate that they are managing their forests responsibly. On top of that, by using direct mail, you are not polluting the environment through the use of electronic power consumption as email and digital channels do. The electricity needed to run computers, routers, servers and PCs comes from energy that may not necessarily be clean to start with. Misconception #4: Direct mail isn’t as personalized, sophisticated or exciting as online channels. If you buy into this, you really haven’t been paying attention to what’s happening with the channel. The advent of high-speed, high-quality digital printing technologies, combined with sophisticated production equipment, has made mail as personalized and relevant as digital channels. Blend in the right data, creative and copy, and you have the recipe for a highly scalable, truly great ROMI! 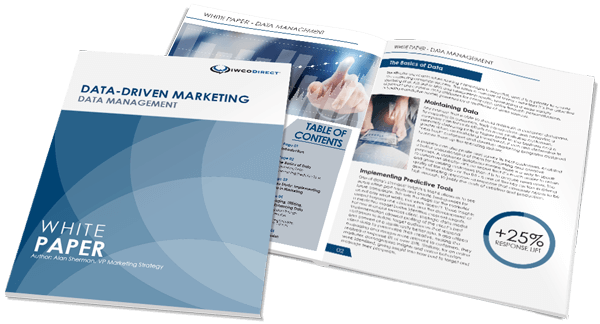 Exciting one-to-one marketing is possible, plausible and easier than ever with direct mail. April Fool’s Day is a fun day with lots of surprises. When it comes to direct mail, though, there is no fooling with the effectiveness of the channel. Get in touch to find out how the experts at IWCO Direct can help your business improve its marketing strategy and tactics with direct mail.